Executive Governor of Lagos State Akinwunmi Ambode has invited international companies to invest in Lagos State, predicting that the region will become the investment destination of choice in West Africa. The message was delivered during a keynote presentation to members of Business Council for International Understanding, the prestigious American business organisation, in Washington, DC, on 20 April. “Lagos is open for business and our focus is on adding value and working with those who will add value to Lagos and Lagosians,” Ambode told more than 30 investors at the exclusive event. The Governor continued by emphasising the importance of investment for job creation, infrastructure, ICT, affordable housing, transport and tourism. “As a future mega city, with our rate of growth, we must face the impending challenges and plan for and embrace the opportunities that come with these challenges,” the Governor said. The event, sponsored by Rendeavour, Africa’s largest urban land developer, and APR Energy, a global leader in power generation, was attended by members of the United States government and the private sector. 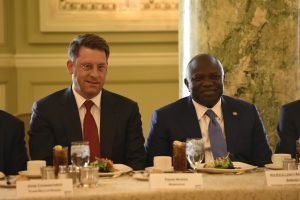 Participants included the U.S. Trade & Development Agency, IBM, Uber, Shell, Chevron, FlourMills and Citi Bank, as well as senior members of the Lagos State Government. Introducing the Governor to speak at the forum, Frank Mosier, Chairman of Rendeavour, congratulated the Lagos State Government on co-operating with the private sector. “Lagos represents one of the most compelling investment cases in Africa, in emerging markets, and perhaps globally. In short, Lagos has superior resources from human capital to capital markets that are ahead of other parts of Nigeria and the rest of Africa,” Mosier said. Rendeavour is investing over $250 million on infrastructure in a mixed-use development in the Lekki Free Trade Zone (LFTZ). A PPP with Lagos State in the North West Quadrant of LFTZ, the development will catalyse an estimated $1 billion of additional investment in Lagos State, and create tens of thousands of jobs. The LFTZ has received an upsurge of attention by Lagos State over the past three years. The recent flag off of the deep-sea port, completion of its breakwater and the construction activity around the Dangote refinery represents an upsurge in investment in the area. The dialogue with investors forms part of a wider push by the Governor to meet the challenges of transforming Lagos into a smart and forward thinking mega-city. Investors attending the panel received the keynote positively, lauding the foresight of the Governor and Lagos State in opening Lagos to private investment.